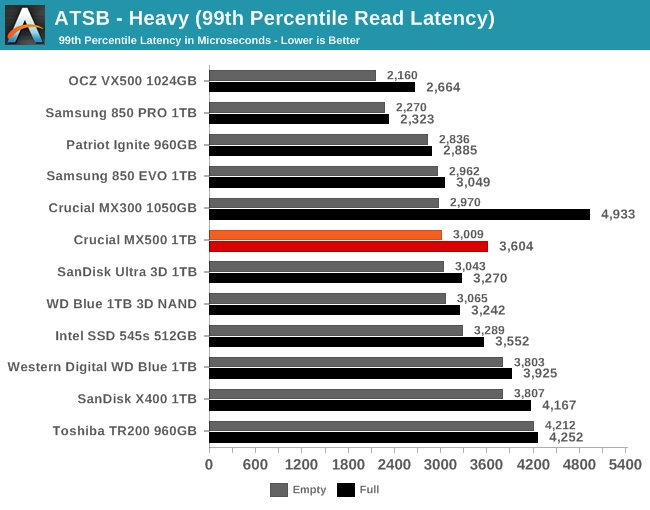 The Crucial MX500 turns in the best average data rate score on the Heavy test that we've seen from a 1TB-class SATA drive. When the test is run on a full drive, the MX500's performance falls below that of the Samsung 850 PRO and 850 EVO. 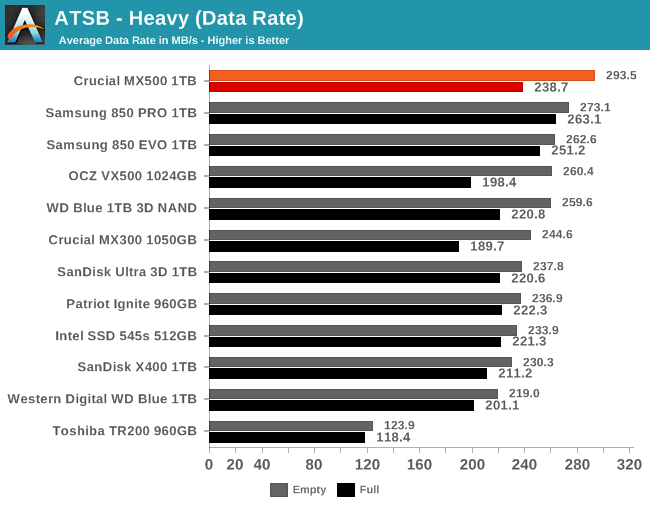 The average and 99th percentile scores of the Crucial MX500 are typical for a good SATA SSD. The MX500 doesn't set any records here, but at least the latency doesn't climb out of control when the test is run on a full drive. This is a notable improvement over the MX300. 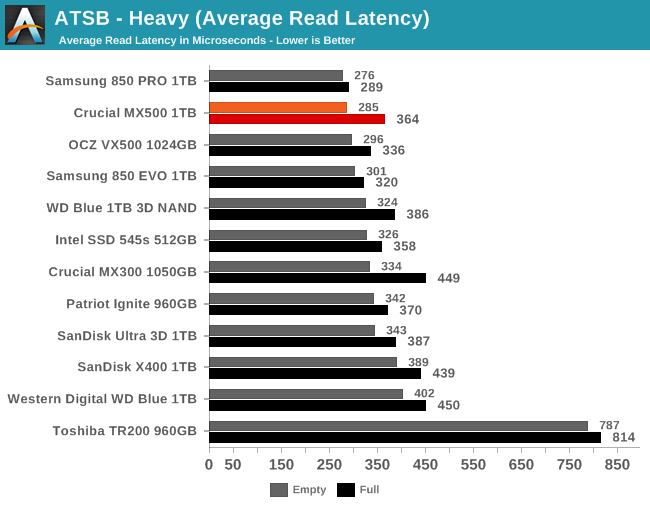 The average read latency of the Crucial MX300 is fast by SATA standards, but it doesn't quite match the Samsung 850 PRO. 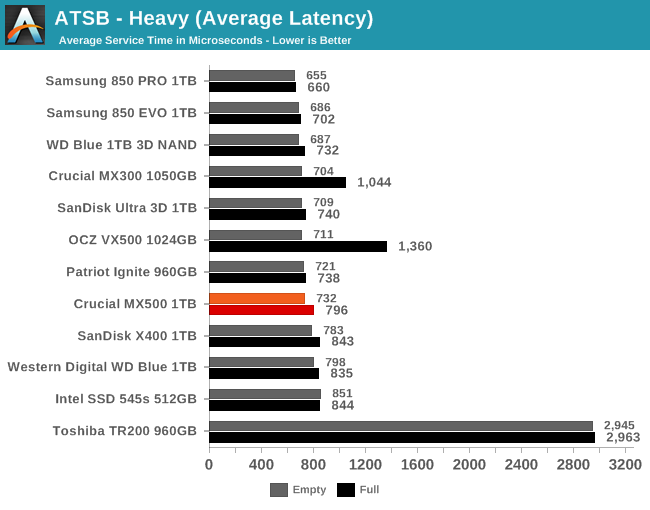 When the test is run on a full drive, the average read latency suffers and the MX500's score is merely average for a mainstream 1TB drive. 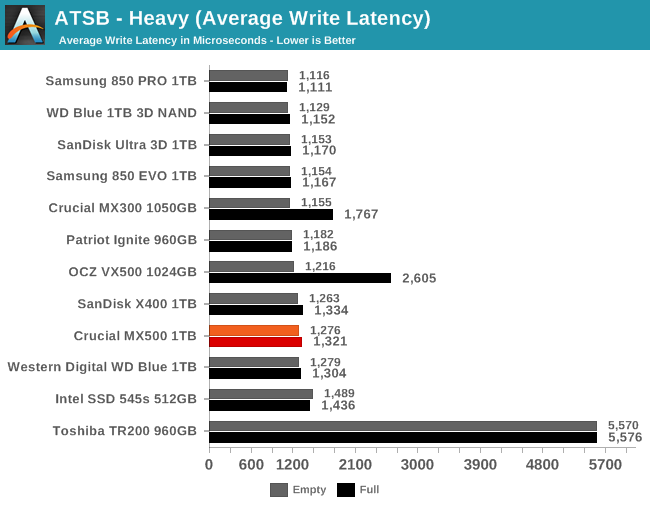 The average write latency is slightly below average in both cases, but not to a degree worthy of concern. 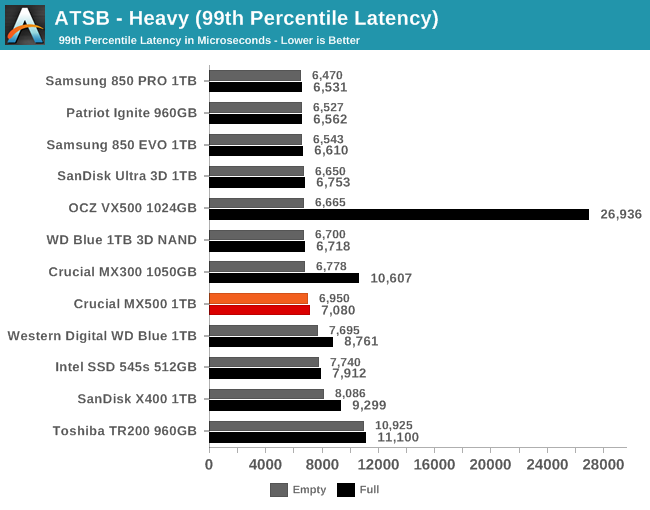 The 99th percentile read latency of the MX500 falls in the middle of the pack, though running the test on a full drive has a bit more of an impact than for most drives. 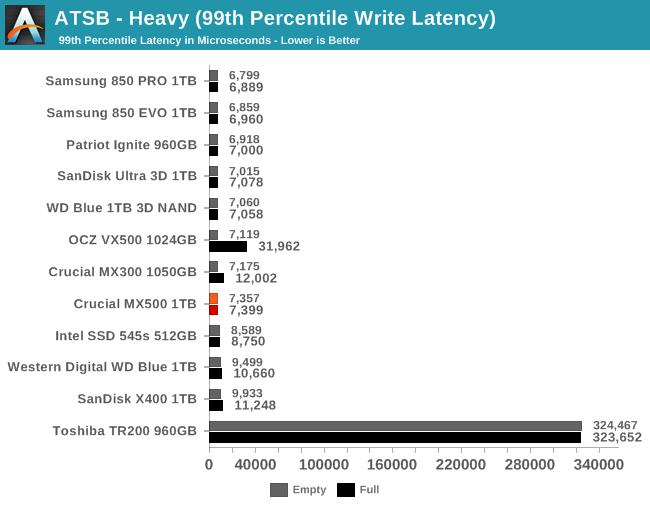 The 99th percentile write latency is reasonably low whether or not the test is run on a full drive. 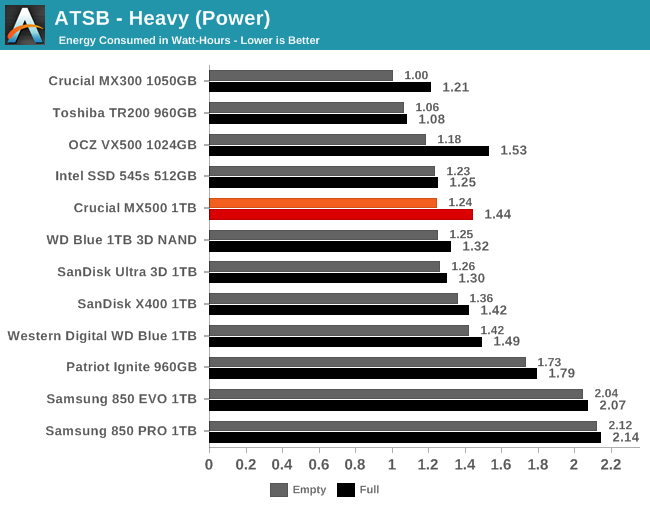 The power consumption of the Crucial MX500 on the Heavy test is significantly higher than the record-setting MX300, but the MX500 certainly doesn't qualify as power-hungry compared to the broader field of competitors. The Samsung 850 PRO and EVO drives require much more power on this test than the MX500.